Cafe on South End serving a mix of British and Turkish food. By July 2012 it was occupied by a firm of chartered accountants and tax advisers called Palmer McCarthy photo, but some time between December 2015 and August 2016 this moved to Suite 70, Capital Business Centre, 22 Carlton Road, CR2 0BS photo of notice. The premises were vacant as of August 2016, September 2016, October 2017, and December 2017 photo. 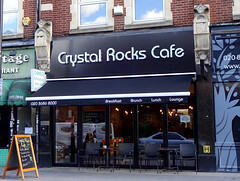 As of February 2018 it had acquired signage for a cafe called Crystal Rocks Cafe photo, and this was open by June of the same year. Last edited 2019-02-07 15:19:19 (version 26; diff). List all versions. Page last edited 2019-02-07 15:19:19 (version 26).